The Case Participants section can be accessed from the 'Analysis' tab from the top navigation bar. It will display the Case Participants involved in the current case or all cases in your account. You can also see the all participants registered in all the cases into your Lexbe eDiscovery Platform account, go to Analysis> Case Participants page. Case Participants are the litigants, deponents, witnesses, and other individuals and organizations in the case that provide factual information. Keeping track of the relationships between and among this 'cast of characters' can be challenging. Lexbe eDiscovery Suite Platform allows you to capture each participant's name, relation to other participants and a description of the role the participant plays in your case. Lexbe makes this easy with the Case Participant view. The type column indicates that the participant is an individual or an organization. Fields are available for 'name', 'role' in the case, and 'affiliation'. You can narrow your search, typing only information from one field to find a specific case participant. This feature will look for matching contacts that contain one or more words specified by the user (e.g. Defendant). You can create case participants by clicking on the 'Create New Case Participant' button. You are then presented with an entry screen with text boxes for all applicable fields. Allows you to import to Lexbe eDiscovery Platform your list of contacts from a contact list prepared on an Excel file. Under the 'Name' field the case participants must be set up in 'Last Name/First Name' format (e.g. Johnson, Joane). Case participants will be effectively sorted by 'Name', if you put the individuals in last name first. When finished, click on the 'update' link to save the record. On the left side of the screen, you may select one or more participants to be removed from the current list. Please note this action will permanently delete the case participant from the 'entire' case. This action cannot be undone. The main table allows you to select Case Participant(s) and then export to and Excel spreadsheet for further formatting. You can select all the case participants in the list or only specific ones. You can print any spreadsheet all the tags related to the Case Participants, after downloading to Excel. The column headings should all be present but information can be left blank. A good way to assure the correct format and heading is to export a spreadsheet to an Excel spreadsheet, modify that spreadsheet by adding or modifying rows, saving in Excel 1997-2003 format, and then re-importing. 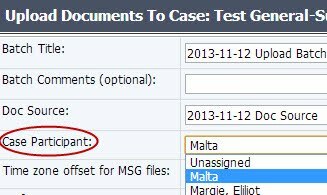 Case Participants can also be assigned from the Case>Add Case Document page. When you open a document in the Document Viewer, you will also be able to assign Case Participants while you are reviewing files. To assign Case Participants from the Browse and Search pages, please select the document(s) from the main table, apply Multi Doc Edit>Case Participant, and then update the change. To filter Case Participants from the Browse or Search pages, please go to the Filter> Select Filters section. First you need to dissociate the Case Participants previously assigned to documents or Facts in the case. This can be done by applying Multi Doc Edit feature (will reverse the assignment), and then you can actually go back to the Case Participant page, select the names you wish to remove from the case and then click on the 'Delete Selected Items' button. Tracking Case Participants by itself is helpful, but Lexbe eDiscovery Platform goes much further by tying case participants to facts. This powerful facility allows you to determine what a particular witness may say based on the documents, depositions and other information in the record or discovery. Associating Case Participants with Facts allows you to better prepare for witness interviews, depositions and examinations. To see how to link case participants to facts, click here, and to link to documents, click here.